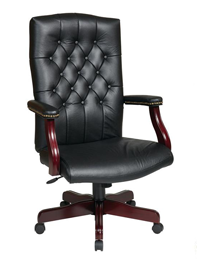 Business executives and CEOs alike come to us for their executive office chairs. With incredible styles and comfort that suits any office decor, from traditional to modern office chairs. Our leather office chairs are classy and professional looking to complete your office space. Designer collection for extra sophistication and superior comfort that you have to see and test out for yourself to believe. Our office chairs have the unique distinction of being sought after by successful people throughout the US and Canada. If you have obtained such status, don't you want one of our fantastic chairs in your office as well? These chairs are perfect for private offices, boardrooms, conference centers and anywhere an executive chair is expected to be seen. Additionally, discounts are available when large quantities of chairs are purchased for your business. While most of our executive office chairs are available in classic brown and black office chairs, many are also available with more modern color choice as well including white, gold, silver and even purple. We can ship virtually anywhere in the world safely and securely. If you are not satisfied with the quality products you have purchased, please follow our returns and exchanges policy. We would be happy to locate a chair that's more to your liking. Contact us today to learn more about our selection of executive office chairs.